Speed windsurfing requires strong winds and flat water (from 20 to 45-50 knots). The boards are narrow (from 45 cm to 55 cm), and sails are big enough to cope with very deep downwind runs (usually 5.5 to 7.0 sq-meters depending on the wind). Fins, on the contrary, are as small as possible to generate as less drag as possible (less than 32 cm). This analysis is built from a Martin Van Meurs's track (sept. 2004). 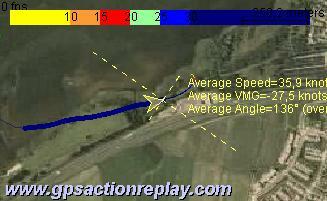 Because of the spot not being large, the averages are computed over 500 meters rather than 2000 meters. Not a lot to say as far as upwind is concerned when speedsurfing. 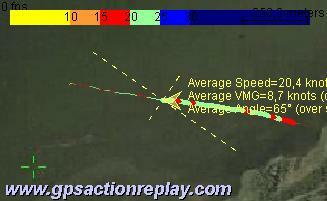 The angle is not close to wind, but a good 20 knots speed enable a good 8 knots VMG. Apparent Wind here is about 40 knots with a 30 knots wind. Very different from downwind. Amazing! 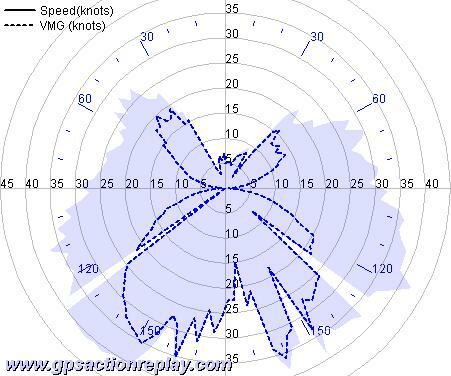 The apparent wind gets a 45° shift within some meters, when Martin is going deeply downwind, and is 90° oriented from true wind. The apparent wind speed drops from 40 to 25 knots (5 knots below true wind, 10 knots below board speed).